The Performing Arts Department of The Troy City School District is dedicated to providing all students in grade k-12 with a quality Music Education. Incorporating and supporting the National and State Arts Standards through, singing, performing, improvising, composing, listening, analyzing and relating music to other arts and cultures. The Troy City Schools Music Department understands that music is an essential part of every student’s education, priding itself on providing a well-rounded music education to all students. A music education that reinforces, creativity, communication skills, teamwork and self-discipline through diverse music and performing arts experiences. Our program offers General Music Classes for students in Kindergarten through Grades 6 and 8. The elementary curriculum is centered using Quaver’s Marvelous World of Music Curriculum for Kindergarten through Grade 6, and as a supplemental resource for 6th and 8th Grades. Students entering Grades 4 through 8 are eligible for the Summer Music Program July 2 – 20, 2018. 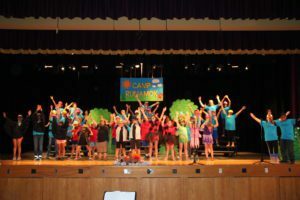 Students will collaborate with their peers to produce a musical performance that includes singing, choreography, stage dialogue, background set design, and props created by students. The program culminates with a performance of “Let’s Eat” on Friday, July 20. Click here for details and an application to be returned by June 18. Elementary school students receive general music instruction once per week. Students in grade 3 may be instructed in string instruments. Students in Grades 4 and 5 are able to participate in additional programs such as the chorus and/or an instrumental program. Students participating in these events perform at least twice a year. All students in grade 6 & 8 receive general music instruction in music and the opportunity to participate in chorus, grade level string orchestras and bands.